THERE ARE LESS THAN 40 TICKETS LEFT FOR THIS EVENT - WE WILL SELL OUT TODAY BEFORE NYE - TICKETS ARE SELLING EXTREMELY FAST - BUY NOW! JUST 2 VIP TABLES LEFT!!! See you & your friends there! Be sure to "Like" & "Share" above to help spread the word!! General admission includes entry to the event at 9pm, 5-hour premium open bar, snacks, champagne toast at midnight PLUS everything else listed below. PLEASE NOTE - Once the # of tickets left reaches zero, the next ticket price increase will happen or the ticket will be sold out - HURRY, PRICES WILL GO UP and we WILL sell out!!! Ticket sales ended at: 12/31/2017 at 6:00 PM $129.95 Ended 23! Includes everything with regular General Admission tickets, just at a great group discount for buying 8 or more tickets together. VIP admission includes Express VIP entry to the event 1-hour early (8pm), free coat check, 6-hour upgraded open bar (8pm - 2am), food buffet, champagne toast at midnight champagne toast at midnight PLUS everything else listed below. This is a discount price and will go up after the limited amount sells out. Includes a table all night long, a bottle of Moet Champagne, and a bottle of Grey Goose Vodka PLUS everything listed under VIP tickets. Minimum 4 guests required for purchase. 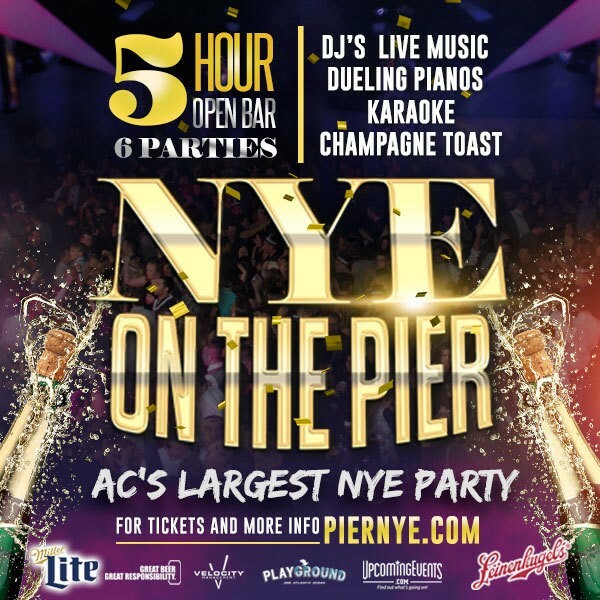 TICKETS ARE ALREADY SELLING EXTREMELY FAST - JOIN US FOR AC's BIGGEST & BEST NYE PARTY!!!!!!!!!!! The biggest NYE Event in Atlantic City with 6 Parties under one roof and room for 3,500 people! Join us at the Playground Pier at Caesars in Atlantic City and party until 4:00AM. The event sells out every year before New Year's Eve. So, don't wait - buy tickets now. This party will offer something to everyone! Don't believe us? Check out the video recap from last year below. Dine on upgraded buffet for VIPs and light snacks for General Admission. Take-in breathtaking views of the Atlantic City skyline while overlooking the Atlantic Ocean. It doesn't get any classier than this. If you have questions about this event, please click "contact the organizer" at the top of this page for a super-fast reply! Tickets start as discount and prices go up as we sell more tickets and get closer to the event date. It's best to buy early and save. If you need a hotel rooms in Atlantic City for New Year’s Eve, click here. For discounted parking rates & options, please click here. Please do not drink and drive. Doors open at 9pm for General Admission. Party until 4am - prices will go up, do not wait to purchase!! 6-Hour Open Bar (8pm to 2am) Yes, enter the event before everyone else an hour early! Minimum of 5 guests required for purchase. Note this event is under new management and will be held in the entertainment section on the first floor at the rear of the Pier. Expect an incredible night like no other in AC ringing in 2018!!!! ALL TICKET PURCHASES ARE FINAL - NO REFUNDS WILL BE GIVEN FOR ANY REASON. We suggest dressing to impress. This is New Year's Eve. It's a special event. We are not enforcing a strict dress code unless someone looks like a slob and should be at the gym vs an event like this. You can dress casual or classy, just know that most of the crowd is coming dressed up. Or, book your stay at The Showboat for only $299 on New Year's Eve! Go to https://gc.synxis.com/rez.aspx?Hotel=70821&Chain=19833&promo=IDPLAY or call in and ask for the "IDPLAY" promotion rate. All sales are final. Please note that there will be a $20/ticket refund fee if you need a refund (must contact us prior to 12/28/17 at 11:59 PM), all other amounts paid will be refunded. How much is coat check? Cost check will be $5 for General Admission ticket holders and free for all VIP ticket type holders. What are my Transport Options Getting to/from the Event? Is there parking? For discounted parking rates & options, please click here. We suggest taking Uber (Get $50 in complimentary ride credits, Code: EVENTS), Lyft (Get $50 in complimentary ride credits, Code: EVENTS), or a taxi. Please do not drink and drive. We always want you to know that we want you to please drink and enjoy yourself responsibly. Flying in from out of town? Check out Atlantic City International Airport for flight schedules. Private Helicopter from NYC - check out HeliNY.com. Party Train from Philadelphia and NYC leaving daily - Check NJ Transit and Amtrak. Pull up a chair, grab a drink and make new friends while you wait for your old ones to arrive on scene. 3,615 square feet of bar and lounge space boast multiple flat screens broadcasting the sports of the season and live feeds from behind the glass doors of the nightclub. Monkey Bar is at the center of it all! Glamor, grace and iconic style – 1921 pays homage to the birth date and place of Miss America. Step back in time and enjoy a cocktail in this vintage-style speakeasy. If 1921 were in a pageant, we're sure she'd win the crown with crystal chandeliers, gold details, and retro-art deco style. In honor of this retro theme, enjoy some retro-bands that play your favorite hits from back in the day or some blues that speak directly to the soul. You don't have to be a beauty queen to hang here, but we'd sure love for you to show us your shoes! Measure the decibels of sound in waves with no limits. The nightclub brings an eclectic music and events space to Atlantic City, NJ. The only nightclub in the Northeast that actually sits over the Atlantic Ocean. 20,000 square feet, 2 Levels, Massive dancefloor, Mezzanine overlooking Dancefloor, O5 Gigantic Bars, VIP Area with Bottle Service, 200K+ watts of sound, State of the art DJ Booth, 40 ft LED Screen. Bo's celebrates classic style with the perfect blend of playfulness. Clean finishes accentuated by retro pieces invite you in and the dueling pianos in the center of the room really steal the show! Where else can you find this kind of entertainment in such an amazing space? We're not telling you what to order, but this place just makes you want a martini. Settle into a U- shaped booth and relax, Bo's is where fun comes easy – could you ask for anything more? Country slang for pretty, Purdy is just that. Hand-stenciled walls show the incredible detail in this intimate space. Cozy, retro furniture invites you to sit down and stay while. The hottest solo acts and dynamic duos will perform here, along with Americana – classic Americana music with a folky feel. There's so much to see and experience at T Street, but Purdy will make you want to order that second glass of wine before venturing out. Purdy is a date night destination done right. Tonkin' American Grandstand is place to find some good ol' fashioned fun. Reclaimed wood, antler chandeliers and a mechanical bull transport you to the south – South Jersey, that is. Rock and roll will keep you stompin' those boots at the perfect place to hang up your hat and get down to some good music. This is the place where you come to play – TAG, you're it! Australian slang for a person with red hair, this Irish Pub feels like your favorite watering hole with its eclectic, vintage décor and laid back vibe. Enjoy the sweet sounds of country music that will keep your toes tappin' and heads bobbin'. One of the larger spaces in T STREET, The Bluey has two bars and plenty of space to hang with some mates. Decked out with retro pieces collected from across the country and across the pond, it feels like this pub has been here forever, doesn't it? View More Events Organized by UpcomingEvents.com - New Year's Eve in Atlantic City. UpcomingEvents.com presents... New Year's Eve in Atlantic City - AC's Best NYE Parties to ring in the new year right! This event is organized by UpcomingEvents.com - New Year's Eve in Atlantic City.